1. The image size must be of maximum 1024 pixels wide and 768 pixels high including any borders and be a maximum File Size within 1MB. The files must be in JPG format at 72 dpi resolution. File must be rename with the Title. 2. The salon is open to photo friends spread all over the world. It will be organized under the approved rules of PSA. All acceptances will count for PSA, and for inclusion in PSA Star Rating and "WhoÃ¢Â€Â™s Who". ALL Images must be the original work of the entrant. If two or more similar images are entered by the same author, the first one getting the acceptance score will be considered for acceptance or award, the other images will not be considered. NO ALTERATION FOR NATURE , PHOTO TRAVEL IMAGES & PJ. IF MONOCHROME IMAGES SUBMITTED IN COLOR SECTION THAN IT WILL BE COUNT FOR PID COLOR STAR PATH NOT PID MONO STAR PATH. 3. "Entries are limited to not more than 4 images (digital files) per section, i.e 20 total images for 5 sections. Images for each section should be uploaded via www.csssociety.com website. A mixed entry of slides and digital images in the same section are not allowed. 5. There are no restrictions as to subject matter except as outlined in the rules and definitions of specific sections. 6. "Entries must originate as photographs (image-captures of objects via light sensitivity) made by the entrant on photographic emulsion or acquired digitally. By virtue of submitting an entry, the entrant certifies the work as his own (aliases are not permitted). 7. The entrant permits the sponsors to reproduce all or part of the entered material free of charge for publication and/or display in media related to the exhibition. This may include low resolution posting on a website. 10. All Acceptances are eligible for statistics applicable to PSA, Distinctions. 11. The decision of the Panel of selectors is final and binding, no further appeal will be entertained. 12. ENTRIES WILL NOT BE JUDGE WITHOUT ENTRY FEE and Entry will be disqualify for judging, the Author must accepts the conditions of the salon. 13. The jury reserves the right to withhold some awards if the quality of submitted photos is not satisfactory. 14. Each author can receive only one award / honorable mention in each section. 15. An entrantÃ¢Â€Â™s four images will be distributed throughout four rounds of judging in that section". 16. Display of the Images : 15'' LAPTOP with resolution of 1024 X 768 pixels with Colour Space : sRGB. 17. No title or identification of the maker shall be visible anywhere on the face of an image, in a PSA Recognized exhibition. Words such as Ã¢Â€ÂœUntitledÃ¢Â€Â and Ã¢Â€ÂœNo TitleÃ¢Â€Â are not acceptable as part or all of an imageÃ¢Â€Â™s title, nor are camera capture filenames or titles consisting of only numbers"
19. All entrants in must provide name and country data exactly the same in each exhibition entered to receive proper credit. 20. The organizer will take all possible care while handling the awards and catalogues, however we assume no liability for damages and loses during shipping. b) the images comply with the rules and definitions as set out in these Conditionsof Entry. This may involve asking the entrant to provide originally captured image(s), with EXIF data intact, by a set deadline. The questioned image(s) of any entrant failing to comply with such a request for the original image(s) may be considered in breach of these Conditions of Entry, and declined. Such entries may be referred to PSA for further investigation of possible ethics violations. 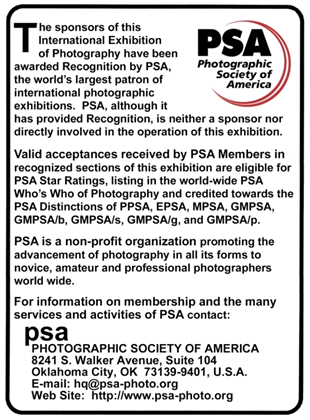 PSA retains the right to investigate in any way all complaints/suspicions of breaches of entry conditions,impose sanctions if deemed necessary, void the acceptances of any image foundto violate the PSA rules, include the entrantÃ¢Â€Â™s name on the list of sanctions provided to Exhibitions, and share such investigations with FIAP. Entrants automatically agree to these terms by the act of entering the Exhibition. A grayscale or multi-colored Image modified or giving the impression of having been modified by partial toning, multi Ã¢Â€Â“toning or by the inclusion of the spot coloring does not meet the definition of monochrome and shall be classified as a color work. "A Photo Travel image must expresses the characteristic features or culture of a land as they are found naturally. There are no geographic limitations. Images from events or activities arranged specifically for photography, or of subjects directed or hired for photography are not appropriate. Close up pictures of people or objects must include features that provide information about the environment. Techniques that add, relocate, replace or remove any element of the original Image, except by cropping, are not permitted. The only allowable adjustment are removable of dust or digital noise, restoration of the appearance of the original scene, and complete conversion to grayscale monochrome. Other derivations, including infrared are not permitted. All allowed adjustments must appear natural. Techniques that add, relocate, replace or remove any element of the original image, except by cropping, are not permitted. The only allowable modifications are removable of dust, scratches, or digital noise, restoration of the existing appearance of the original scene, sharpening that is not obvious, and conversion to grayscale monochrome. Derivations, including infrared, are not eligible. A Black and white work fitting from the very dark grey (black) to the very clear grey (white) is a monochrome Work with the various shades of grey. A black and white work toned entirely in a single color will remain a Monochrome work able to stand in the black and white category; such a work can be reproduced in black and white in the catalogue of a salon under FIAP Patronage. On the other hand a black and white work modified by a partial toning or by the addition of one color becomes a color work (polychrome) to stand in the color category; such a works requires color reproduction in the catalogue of a salon under FIAP Patronage. Entries must originate as photographs (image captured of objects via light sensitivity) made by the entrant on photographic emulsion or acquired digitally. Pictures on any subject including creative or experimental images can be submitted.